This isn’t CCP’s first attempt at creating an action game in the world of EVE. Dust 514 was a complex, massively multiplayer FPS that shared real time cross-platform integration with EVE, allowing the action-game players fighting on the surface of planets in Dust to call in earth-shattering air strikes from the MMO players’ spaceships. Unfortunately for Dust 514, it was released exclusively for PlayStation 3 just six months before the release of the PlayStation 4. Old hardware and a dwindling player base would eventually cause CCP Games to shut down Dust servers in May of 2016. Since then, the small but dedicated player base has been hoping for another chance to see their War Clone super soldiers in combat once again. 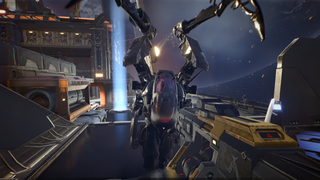 In April 2016, CCP announced Project Nova as a spiritual successor to Dust 514, this time for PC. CCP brought a playable alpha build to show to its fans at the EVE Vegas convention last month. These PVE sessions lasted a few minutes, as players controlled points and fought back the ever-escalating horde, dealing with the various types of enemies that the game is able to throw at them. If players were able to hold all three victory points for long enough, they won, either by gaining the requisite amount of points necessary to complete the stage, or by activating the battleships guns and watching the invading Sansha’s ship get blown out of the sky, earning a quicker alternative victory. CCP representatives at the show said that eventually players will be rewarded with different forms of loot to customize and progress their characters, but this feature was not available in the alpha build. Player vs Player gameplay was also absent in the demo, though the developers described their intended gameplay to the gathered crowds. Players will join PvP as groups of four, either via matchmaking or with friends, then join three other squads to join a game of 16 versus 16. The default PvP mode that the team has planned involves each team trying to deliver their own payload across the map.This will require teams to split up between guarding and pushing their own payload, assaulting and delaying their opponents, and roaming the map scouting for the opposition. The Alpha build of Project Nova was very limited and of course unpolished, as you would expect from an early development build. But already, the shooting and overall movement seemed to be a solid foundation to build upon. Snorri Árnason, Nova’s game director, said several times over the weekend that the team wants to build Nova “with the community, rather than for the community.” CCP said that EVE Vegas attendees will start receiving Alpha invites sometime in November. The publisher said it plans to involve the community in a lot of the game building decisions through feedback during the alpha stages. Meanwhile, emails have already gone out to former Dust 514 veterans, allowing them to reclaim their in-game names for use in Nova.